The bird-gang have taken up residence on the back terrace this afternoon, and are having a great time rootling through the weeds (unweeded), the dead leaves (uncleared) and the grass (couch, don’t ask) that surrounds it. 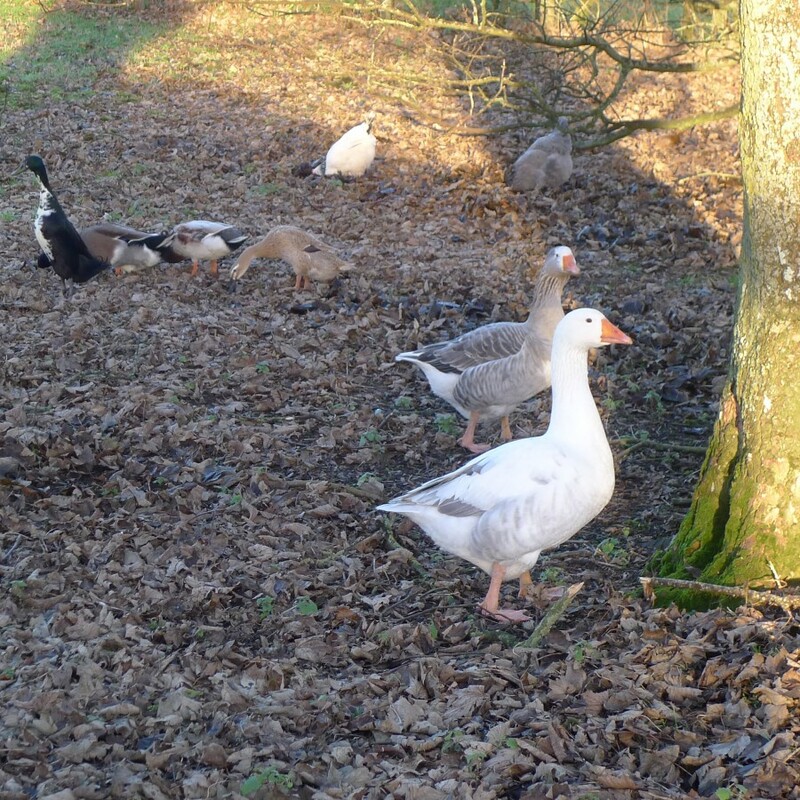 The geese are top of the pecking order (quite rightly, they are adorable, but being big probably has more to do with it), and largely call the shots in Poultropolis, the avian stronghold out back. There are also 4 Indian runner ducks, who idolise the geese in much the same way as small children hero-worship an older sibling. It is the ducks perennial wish to be simply allowed to hang out with the geese, and they are frequently seen trailing after them longingly, never quite keeping up on their shorter legs. The ducks are currently nameless. At first Junior-Senior named them all after his (male) school friends, which was OK, if confusing. However a very unlucky incident between an inexperienced, barely sexually mature male and female duck in the pond left me having to explain to interested parties that we had realised that Harry was in fact female, when Gregory had drowned him by accident, trying to shag him. That just sounds bad somehow. So currently they are just “the ducks”, whilst I review the naming conventions of the house, and negotiate with J-S, who is adamant that his names should stay. Last, but by no means least – especially at this time of year when they are the only section of the feathered menagerie actually laying eggs for us – are the hens. Currently we have 5. They are Max, Torch, George, Arabella and Me. Despite some of the names (thank-you J-S and his class) they are all girls. “Me” is a legacy from a time not so long ago, when Junior-Junior was still only 2, and came up with the timeless names “Me”, “Another Chicken” and “Another ‘nother” for his trio of birdies. “Another” and “Another ‘nother” have gone the way of all chickens, but “Me” is going strong, and even laying the odd egg when the days are long and balmy. Today is not balmy. In fact it is bitter, and hoying it down. Still, the gang need to be rounded up and steered / coerced / bribed into their respective lock-ups before the evening child-chauffering service resumes, and dusk and foxes appear.